Why the "Mysterious Face" addendum to the title? We have astronomical asterisms for a group of stars that resemble a common object, like the Big Dipper. To me, IC 59, the nebula at the right side of the image, resembles a human face, with a perfectly formed nose pointing toward the lower left, a chin below, and a dark reddish area for the eye above. It gives the appearance of deep contemplation of its neighboring nebula, IC 63. Do you see it? 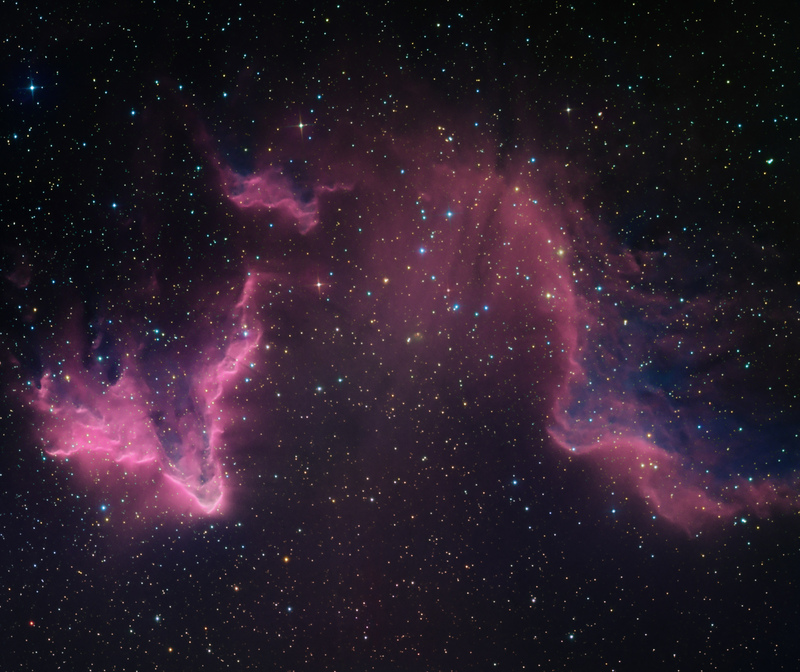 IC63 (left) and IC59 (right) are collectively known as Sharpless 2-185 (Sh 2-185). They are both illuminated by the B0 IV star , Gamma Cas, which is below the image. Both nebulae are close to this ionizing star at about 190 pc, but have very different visual appearances. IC63 can be referred to as a "cometary cloud", is pointing toward Gamma Cas, and is narrower and more sharply defined than IC59. Spectral measurements suggest that IC59 is slightly cooler at 590K and less dense than IC63 at 630K. They are not separate nebulae, but are part of a much larger nebulous region surrounding Gamma Cas based upon the WHAM (Wisconsin H-alpha Mapper) survey that is approximately 2 degrees in size. IC63 has bright filaments, clearly shown in my images above, that are suggested by Karr et. al to be ionized fronts of gas created by Gamma Cas, and seen by us as nearly edge-on. Both nebulae exhibit spectroscopic evidence from the mid-infrared of molecular hydrogen and polycyclic aromatic hydrocarbons (PAH). In summary, the contrast in appearance between IC63 and IC59 is consistent with a difference in actual distances from Gamma Cas and small differences in temperature and column density. There is some discussion in professional circles as to whether the H-a signal that we pick up in our images is actual emission from the nebula, as posited by Karr et. al, or reflection of the H-a emitted from Gamma Cas that is scattered by the dust in IC59 and IC63. This light scattering and reflection is called ERE, extended red emission. Gamma Cas is the prototype B0 IV star, emitting significant H-a. It is above the main sequence with a more extended atmosphere. Being somewhat cooler than a BO V star, it is only marginally capable of ionizing molecular hydrogen in its vicinity. Thus, it is possible that the H-a we pick up in our images is a mixture of both processes; direct H-a emission from ionization, and ERE. Multiwavelength spectroscopic analysis is the means to resolve this issue, and much of this lies in the realm of professional equipment and analysis. Nevertheless, it is fascinating to be able image these objects with modest backyard equipment and be aware that an understanding of these objects is still being researched. From Karr et. al "A Multiwavelength Study of IC63 and IC59, The Astronomical Journal, v129, February 2005, pp 954-968. Exposure: 19.25 hrs Total; 8 hrs Astrodon H-a, 11.25 hrs Astrodon Gen II RGB.